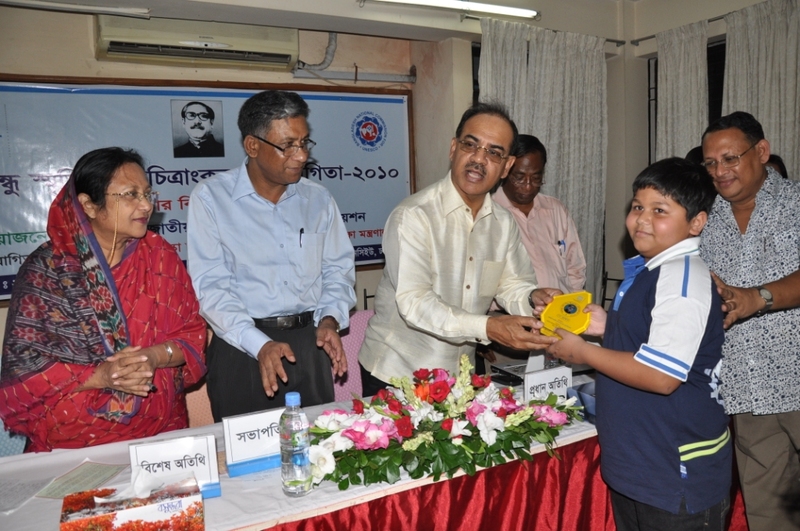 Dhaka, October 26, 2010: Ibrahim Sobhan, eldest son of the Co-Chairman of Bashundhara Group Mr. Sadat Sobhan, won the National Association of UNESCO Clubs in Bangladesh prize for the year 2010. A third grader of the American International School in Dhaka, Ibrahim Sobhan was adjudged for the 7th place under Group-Ka of the ‘Bangabandhu Memorial Children Art Competition – 2010’. The National Association of UNESCO Clubs in Bangladesh hosted the competition under its annual scheme aimed at promotion of art and culture among the children and juveniles. This year’s event was dedicated in the memory of the father of the nation Bangabandhu Sheikh Mujibur Rahman. Several hundred contestants from different international schools in the city joined the competition under three catagories. Minister for Commerce Muhammad Faruq Khan MP gave away prizes among the winners as the chief guest at a function that took place at the auditorium of the BNCU yesterday evening. State Minister for Liberation War Affairs Captain (Retd) AB Tajul Islam joined the function as special guest. Additional Secretary to the Ministry of Education Mr. Mohammad Sirajul Islam presided over the prize distribution ceremony. Managing Editor of the state-run wire service BSS Mr. Azizul Islam Bhuiyan, renowned sociologist and a Professor of Dhaka University Masuda M Rashid Chowdhury and the Secretary General of National Association of UNESCO Clubs in Bangladesh Mahbubuddin Chowdhury among others addressed the function.